The YJ-18C is China's version of the Club-K cruise missile built by Russia that also uses a launcher disguised as a shipping container. 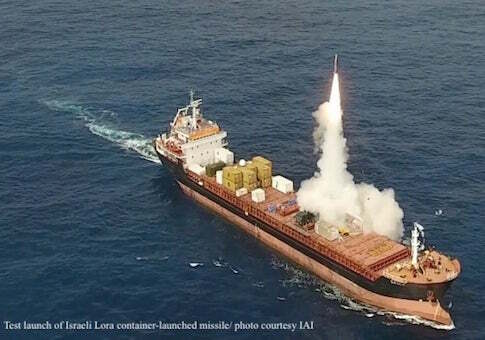 Israel also is working on a container-launched missile called the Lora. The new missile also could undermine China's current buying and building spree for international commercial port projects. Other locations include Pakistan's Gwadar port near the Arabian Sea and in Djibouti on the Horn of Africa close to the strategic choke point of the Bab el Mandeb at the southern end of the Red Sea. "It fits with China's penchant for seeking asymmetric advantages against its enemies," said Fisher, a senior fellow at the International Assessment and Strategy Center. The new missile also supports China's longstanding development of deniable technologies such as a hard-to-track shipping container fitted with missiles. "Containerized missiles give China, Russia, and its rogue state partners new options for directly or indirectly for attacking the United States and its allies," Fisher said. "Shipping container missile launchers can be smuggled through ports or via highway ports of entry and stored for years in a climate-controlled building within range of U.S. military bases, and taken out when needed for military operations," he added. "Potentially, Chinese missile launching containers could be stored near the Port of Seattle, waiting for the day they can launch an electromagnetic pulse (EMP) warhead-armed missiles over the Bangor nuclear ballistic missile submarine (SSBN) base," Fisher said. "The EMP blast might take out electronics on the [submarines] and all over the base without having to launch a nuclear missile from China. Washington would be in chaos, would not know against whom to retaliate, and perhaps China uses American distraction to begin its real objective, the military conquest of Taiwan." China's state-owned Cosco shipping company is currently selling its Long Beach, Calif., shipping terminal as part of a deal completed last year to buy a rival container shipping line Orient Overseas International Ltd.
"China has had considerable problems with propulsion of all kinds and the YJ-18 uses a reverse engineered Russian design turbofan in the subsonic cruise body," Carlson said. During a conflict, "China’s substantial commercial base, its access to ports, and its military-to-military contacts in the Caribbean might prove useful," Ellis told Radio Free Asia. "All of these add up to growing Chinese influence in a region located close to the U.S. as well as its most important Atlantic coast military facilities." "In the future, China could use its control of deep water ports in the Western Hemisphere to enhance its global operational posture," Faller said. "Particularly concerning is China's effort to exert control over key infrastructure associated with the Panama Canal." China's port in Jamaica will serve as a transshipment hub for Chinese container ships arriving through the Panama Canal. In Panama, Chinese President Xi Jinping signed multiple cooperation agreements with the government there and the country's leader President Juan Carlos Varel has voiced support for China's Belt and Road program.